Elite Series Season 3 - Fixtures Announced & Free Tickets Now Available! The first five weeks of the competition will be league play, with each team having four weeks of play and one bye week. This new smaller group format makes each game matter. Just a couple of wins could see any team rocket from last place to first! Whichever teams finishes 1st in a group will receive a bye through to the semi-finals. Meanwhile, the team that finishes 2nd in group A will play the team that finishes 3rd in group B, and vice versa. From there, we’re left with a standard knockout format that will continue until we crown a single winner in each game. This means that every quarter final match will be two teams that haven’t played each other yet - so teams will need to be watching the other group’s games closely in regular season. You never know who you’re going to be drawn against in the playoffs! Friday night is now FIFA night as we kick off the weekend with four hours of football! 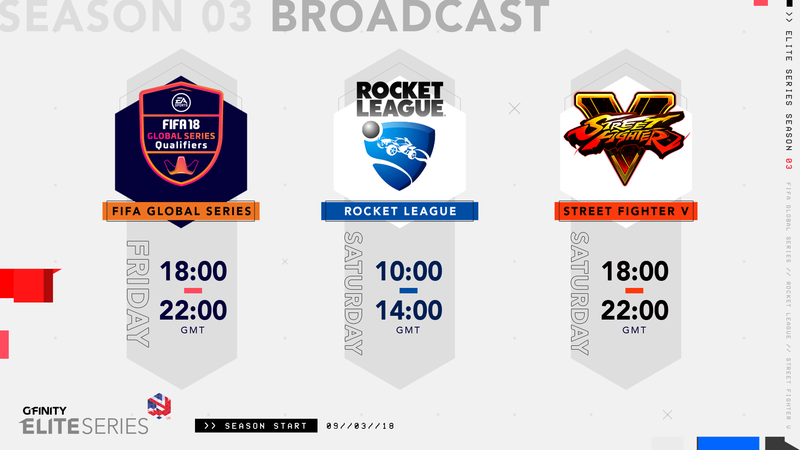 Rocket League keeps its popular Saturday morning spot and Street Fighter moves to Saturday evenings to round out the week. FIFA Fridays, Rocket League Lunchtimes and Street Fighter Saturday - get it memorized! The season starts on Friday March 9th with FIFA, then Rocket League and Street Fighter V on Saturday March 10th!